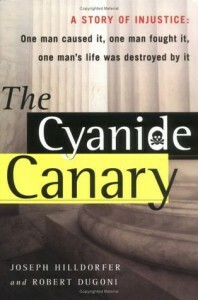 The Cyanide Canary, Joseph Hilldorfer and Robert Dugoni, Free Press, 2004, ISBN 9780743246521, 352pp. We lived and worked in eastern Washington State during the mid-1990s for environmental companies and both had to take safety classes where they explained the dangers of confined space entries and the precautions you have to take for working in those environments, not to mention all the other regulatory and safety requirements needed for working with hazardous chemicals. We were lucky: we were educated, well-paid, working for environmental clean-up companies with lucrative government contracts where safety was good business practice. The circumstances detailed in The Cyanide Canary are 180 degrees different. Allen Elias, the owner of the Evergreen facility, was not engaged in environmental cleanup, but working on the cheap trying to develop a commercial means of reprocessing waste. His employees were high-school graduates desperate for a job, with no safety training or understanding of the requirements for confined space work, nor any clue, really, about the hazards of certain chemicals–things Elias did know. Which is why Elias was charged with criminal conduct after one of his workers was injured during a tank cleanout. The story of the accident, along with the resulting investigation, and trial, makes up this book, which reads like a long Law & Order episode, almost complete with the “Ka-Chung” sound at the end of each chapter. As such, it should appeal to Law & Order fans, or anyone with an interest in how environmental law is being developed. The weakest part of the book is the beginning chapter, where the authors attempt to portray the events of the accident in an almost novelistic method, including trying for some suspense about whether the victim, Scott Dominguez, would survive or not. After they get that out of the way (more than likely, a suggestion from some bone-headed editor who felt the beginning needed some punch or a grab for the reader), the book settles down into its portrayal of Hilldorfer’s investigation, bolstered by all the interviews and transcripts that were eventually used to indict Elias and bring the case to trial. The truly riveting part of the book is not the opening, but the trial, the question of whether Elias will be found guilty, and whether or not he will attempt to flee justice. I enjoyed the book quite a bit, reading it in two sessions during a train ride to and from NYC. It’s a revealing look into the legal world, and also an interesting case study between the kinds of murder cases usually seen on Law & Order and the “white collar” crime that usually does not end up in jail sentences for the convicted.